Thank Goodness there is more to kayaking than risking your neck shooting wild Rocky Mountain rapids. Paddling Deep Fork River this weekend was great fun and we can't wait to get out on the North Canadian River. It is no surprise to us that recreational kayaking is growing by leaps and bounds all over the U.S. and abroad. New kayak designs, materials, and technologies have made the sport possible for virtually anyone. Recreational kayaks normally offer: larger cockpits for easier entry and adding carrying capacity for paddlers of more..*ahem*...generous sizes. They are shorter and wider to make them less 'tippy' and loaded with cool features like fishing rod holders. Why not enjoy some kayak fishing in your local lakes, ponds and slow moving rivers, when you can get the boat for a few hundred bucks? A recreational kayak is a fun, inexpensive way to get outdoors, get active and get some excercise...heck if this hurricaine season continues much longer you may need one to get out alive! Dianne and I bought our first one at Academy Sports in Tulsa. It is a 9.5 foot Heritage Angler kayak, we considered buying a canoe, we couldn't decide who would get to drive. When we just had to have another kayak, we decided to try a different brand. This time we bought a 9.5 foot Perception Swifty. 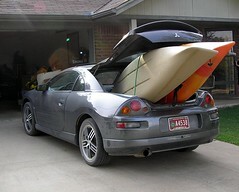 By having two kayaks, we don't have to argue about who will drive. I may still buy a canoe one of these days for cargo capacity on multi-day camping trips, but for day trips paddling around Oklahoma our boats work fantastic. The two kayaks we bought are very comparable in size, function, features and price. However, we both agree that in a head-to-head kayak comparison the Heritage was a better all around deal. The Swifty cost a little more and doesn't have quite as many features. Both boats come with a paddle, adjustable foot pegs, and comfortable seats, but the Hertiage Angler also has two built-in Rod Holders and straps down lines on both the bow and stern. he Swifty lacks any rod holders and only has a strap down line on the stern. We enjoy both our recreational kayaks for regular paddling, exploring and Kayak Fishing . If your Yak doesn't come with rod holders, you can always add them yourself. Whether it is in a pond, river, lake or ocean, fishing from your kayak keeps you out of the weeds, moss and other obstructions that line the shore. Go where the fish are! Your kayak will allow you to slip silently up the narrowest channels to the shallows where the biggest fish are feeding. TexasKayakFisherman.com - Covers Kayak Fishing across the vast stretches of shallow water around the Texas Gulf Coast. PlasticNavy.com - Saltwater Kayak Fishing with the Plastic Navy. Great KFing photos and information! Both sites are focused on ocean kayak fishing. Freshwater kayak fishing sites are still few and far between...but I'm keeping my eyes open! If you know of one, email me the link or drop us a comment!